ABSTRACT: At around 2040-2050 we will be in a new major Solar Minimum. It is to be expected that we will then have a new “Little Ice Age” over the Arctic and NW Europe. The past Solar Minima were linked to a general speeding-up of the Earth’s rate of rotation. This affected the surface currents and southward penetration of Arctic water in the North Atlantic causing “Little Ice Ages” over northwestern Europe and the Arctic. EXCERPTS: At around 2040-2050 the extrapolated cyclic behaviour of the observed Solar variability predicts a new Solar Minimum with return to Little Ice Age climatic conditions. The date of the New Solar Minimum has been assigned at around 2040 by Mörner et al. (2003), at 2030-2040 by Harrara (2010), at 2042 ±11 by Abdassamatov (2010) and at 2030-2040 by Scafetta (2010), implying a fairly congruent picture despite somewhat different ways of transferring past signals into future predictions. The onset of the associated cooling has been given at 2010 by Easterbrook (2010) and Herrara (2010), and at “approximately 2014” by Abdassamatov (2010). Easterbrook (2010) backs up his claim that the cooling has already commenced by geological observations facts. At any rate, from a Solar-Terrestrial point of view, we will, by the middle of this century, be in a New Solar Minimum and in a New Little Ice Age (Figure 7). This conclusion is completely opposite to the scenarios presented by IPCC (2001, 2007) as illustrated in Figure 3. With “the Sun in the centre”, no other conclusion can be drawn, however. While it is well known that solar activity can bring down power grids, its power to affect climate is greatly ignored. The magnetic fields involved can produce eddy currents in the oceans and warm them, etc. More studies need to be done. This article is on the right track. 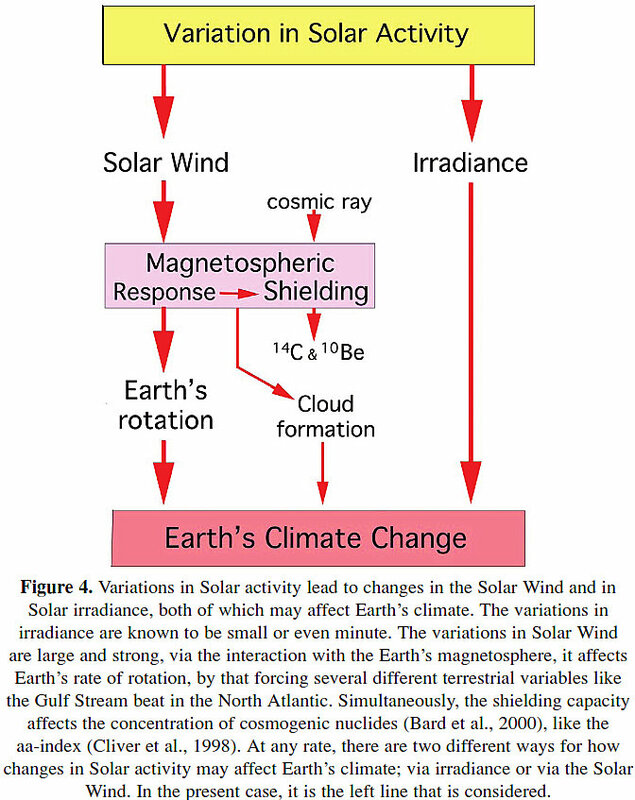 The reducing of Earth's magnetic field complicates a Sun driven event. It is likely to be more complicated than stated, and this possible effect should be included in their analysis. It is amazing how many scientists have discounted the impact of changing solar activity on Earth's climate. Clearly solar activity is variable and so is the climate. When you compare the variations of solar activity in the past with the climate, there is no deviation, when the Sun acts a certain way so does temperatures. Clearly, solar winds, cosmic rays, and cloud formation have impact on temperature. All one has to do is open one's eyes to see this. I think this solution to the problem is too complicated. I think that instead the changing mix of particles and wavelengths from the sun alters the vertical temperature profile of the atmosphere via chemical processes involving ozone and nitrogen oxide. The result is a shift in the air circulation systems to alter cloud quantities and global albedo. That then affects the amount of energy retained by the oceans for subsequent release to the air. That fits observations far better than the process described here. Let's hope that many politicians will read this article and stop funding the IPCC bogus science. Like professor Easterbrook has said, the cooling has already commenced. Just open your eyes instead of believing the charlatans with their false claims of global warming, or climate change as it is called nowadays. Yes, the climate is changing all right, but towards a new Maunder Minimum. Landscheidt thought that the top few hundred meters of ocean depth buffered heat through solar minima. 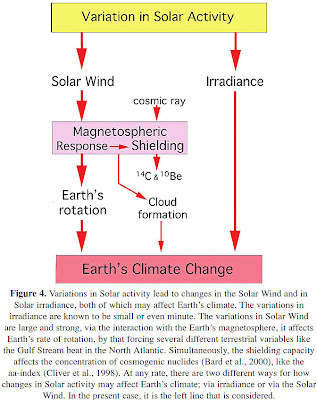 It is interesting to note that the skin depth for magnetic fields in the oceans is a few hundred metres so periods of reduced solar magnetic activity will result in reduced energy inputs through this mechanism in addition to increased cloud formation through increased cosmic particle flux. I have been unable to quantify this effect. Has it been done? Interestingly, many in Australia still believe in global warming. Interestingly, the demonstrators carbon tax are not current with the science. When sold as junk science policy is not a disagreement on an intellectual level.It is a manifestation of the deficiency of character. There is no such thing as "conventional science.